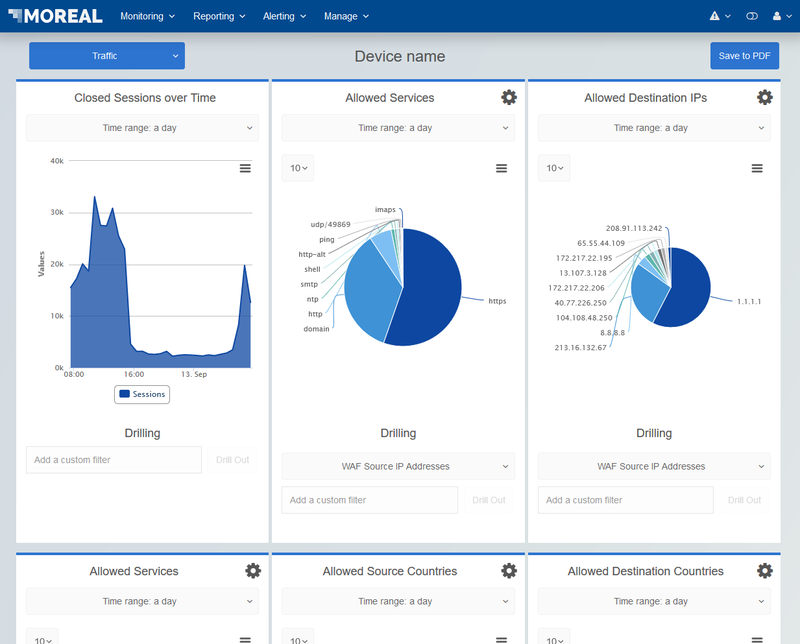 The Device Live Monitoring screen contains charts that are generated from the logs derived from devices assigned to logged-in user’s organization and specifically assigned to the logged-in user. A privileged user can define new charts from the Report Types screen or reorder/remove charts from the Report Templatesscreen. Both screens are described in different sections of this documentation. The predefined sets of charts can be exported to pdf file by clicking on the Save to PDF button located at the top right corner of the Device Live Monitoring screen. On the top left corner a Report Template can be applied to the current device using the dropdown select menu. A toggling set of pie/bar/column charts. The charts can be toggled using the cog icon that is located on the top right of each chart box that allows this function. Please visit the Device Chart Examples for more detailed information concerning individual charts.